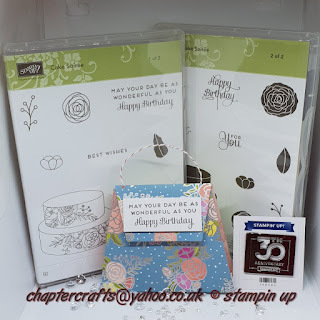 Sweet soiree tag bag Stampin up! Hello and welcome back to Chapter Crafts. Today I have made a very simple tag/bag using the sweet soiree from the spring/ summer catalogue from Stampin up! Sweet soiree designer series paper 9 1\2" x 4 1\4"
Score at 3 1\4", 3 7\8", 4 1\2" & 7 3\4"
Mark 1 side at 1" & 3 1\4"
Mark other side 5\8" & 3 5\8"
Mark, cut and fold as instructed in video. Attach bakers twine for the handle. Labels: Sweet soiree tag bag Stampin up!